Custom magnetic bookmarks, creation and manufacturing. • Custom magnetic bookmarks, custom made models and sizes, manufactured in stainless steel. • Customization of theses items by screen imprint, offset printing or laser, on 1 or 2 sides of the product. 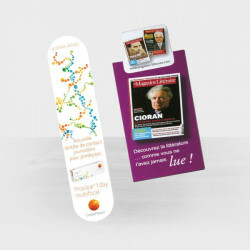 • Individual OPP bag as packing for all our custom magnetic bookmarks. Others packagings available on inquiry.